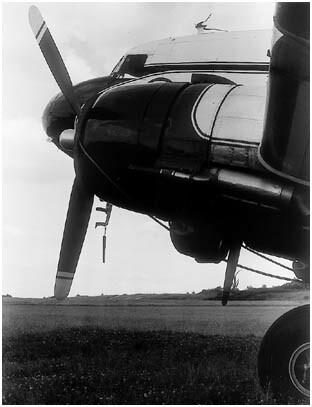 Ensign Selfix 820 Folding 120 roll film camera. Photograph gallery. 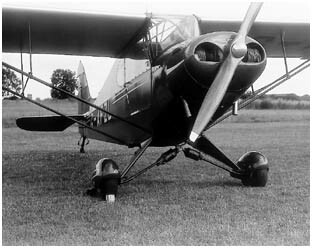 The aeroplane is a 1939 Porterfield CP50, G-AFZL. Stopping down to f/22 dramatically deepens the depth should you require, the exposure being 1/25th in this case. The glow around the edge of the picture is a problem with the scanner, not the 50 year old camera. 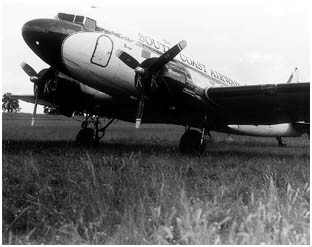 The aircraft is a DC3 (Douglas Commercial Type 3). Dating from the 30s there are still a few hundred going strong all over the world, this one serving with a small airline out of Bournemouth. After the third picture came out with too much foreground and not enough sky, I guessed there might be a problem. The viewfinder on top of the Selfix is very susceptible to damage - any slight bend in the base plate that acts as a stop for the front element of the viewfinder will dramatically effect the accuracy. This example was found to have a bend slightly less than 0.25mm, easily fixed if you know what to look for. All the previous shots were the full depth of the negative, the purpose here was to selectively enlarge a very small part of the negative to see how the Ross performed. The picture was exposed at 1/100th and f/11. 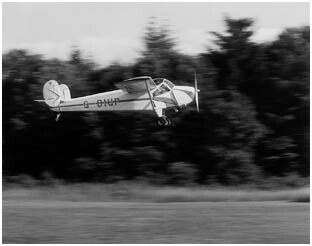 The actual print was 10 x 8", had the whole negative been used - the print would have been 34" across. On the original, individual screw heads can be seen, which speaks quite well for the Ross Xpres. This despite no fewer than six air bubbles being discovered in the front element group and three in the rear, so much for the quality control at Ross in the 50s.